Use the rasterstats.zonal_stats() function to extract raster pixel values using a vector extent or set of extents. You will need a computer with internet access to complete this lesson. 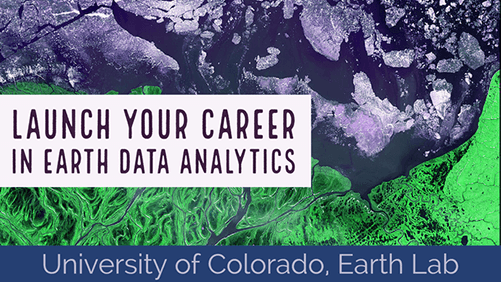 You will also need the data you downloaded for last week of this class: spatial-vector-lidar data subset. In this lesson you will extract pixel values that cover each field plot area where trees were measured in the NEON Field Sites. The idea is that you can calculate the mean or max height value for all pixels that fall in each NEON site. Then you will compare that mean or max height value derived from the lidar data derived canopy height model pixels to height values calcualted using human tree height measurements. Import the canopy height model that you wish to extra tree height data from. Clean up that data. For instance if there are values of 0 for areas where there are no trees they will impact a mean value calculation. It is better to remove those values from the data. Finally you will import and create a buffer zone that represents the area where trees were sampled in each NEON field site. To begin, import your python libraries. First, you will import a canopy height model created by the National Ecological Observatory Network (NEON). In the previous lessons / weeks you learned how to make a canopy height model by subtracting the Digital elevation model (DEM) from the Digital surface model (DSM). As you learned in the previous raster lessons, you will use a context manager with to create a connection to your raster dataset. This connection will be automatically closed at the end of the with statement. Bar plot showing the distribution of lidar canopy height model pixel values. Looking at the distribution of data, you can see there are many pixels that have a value of 0 - where there are no trees. Also, using the NEON data, values below 2m are normally set to 0 given the accuracy of the lidar instrument used to collect these data. Set all pixel values ==0 to nan as they will impact calculation of plot mean height. A mean calculated with values of 0 will be significantly lower than a mean calculated with just tree height values. Bar plot showing the distribution of lidar chm values with 0's removed. You now have a cleaned canopy height model for your study area in California. However, how do the height values extracted from the CHM compare to our manually collected, field measured canopy height data? To figure this out, you will use in situ collected tree height data, measured within circular plots across our study area. You will compare the maximum measured tree height value to the maximum LiDAR derived height value for each circular plot using regression. First, import the shapefile that contains the plot centroid (the center point of each plot) locations using geopandas. Finally, a quick plot allows you to check that your points actually overlay on top of the canopy height model. This is a good sanity check just to ensure your data actually line up and are for the same location. If you recall in week 2, we discussed the spatial extent of a raster. Here is where you will need to set the spatial extent when plotting raster using imshow(). If you do not specify a spatial extent, your raster will not line up properly with your geopandas object. Map showing SJER plot location points overlayed on top of the SJER Canopy Height Model. Each point in your data represent the center location of a plot where trees were measured. You want to extract tree height values derived from the lidar data for the entire plot. To do this, you will need to create a BUFFER around the points representing the region of the plot where data were collected. In this case your plot size is 40m. 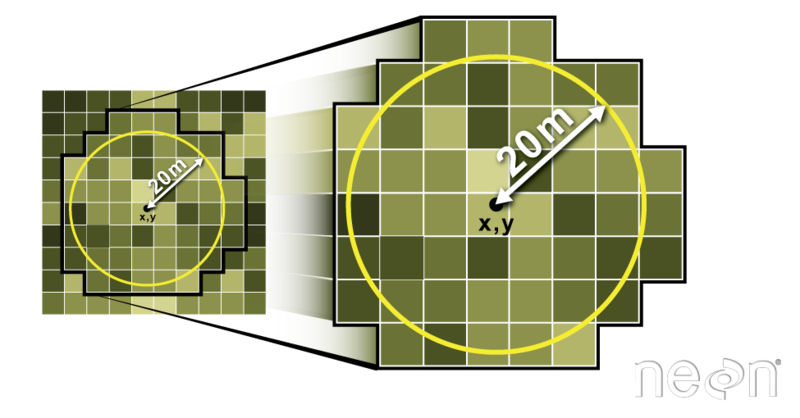 If you create a circular buffer with a 20m diameter it will closely approximate where trees were measured on the ground. Buffer the points layer using the .buffer() method. This will produce a circle around each point that is x units radius. The units will coincide with the CRS of your data. This known as a buffer. When you perform the buffer, you UPDATE the “geometry” column of your new poly layer with the buffer output. Finally, export the buffered layer as a new shapefile. You will use this layer when you use the zonalstats function. Below you first check to ensure the outputs directory exists that you wish to write your data to. Then you export the data using the to_file method. Once you have the boundary for each plot location (a 20m diameter circle) you can extract all of the pixels that fall within each circle using the function zonal_stats in the rasterstats library. Because a numpy array has no spatial information, you provide the affine data which is the spatial information needed to spatially located the array. Convert the list output to a geodataframe that you can plot the data. Below is a bar plot of max lidar derived tree height by plot id. This plot allows you to see how vegetation height varies across the field sites. Bar plot showing maximum tree height per plot in SJER. You will not need to perform the steps below for this weeks homework. However, if you were really working with lidar data, you may want to look at the distribution of pixels in each extracted set of cells for further analysis. The steps below show you how to do this. If you want to explore the data distribution of pixel height values in each plot, rasterstats includes the datapoints corresponding to each zone. To access this, we included the raster_out keyword argument when we calculated the raster stats. The raster_out argument creates a small raster with just the pixel values for each individual plot. You can then plot a histogram of each plot to assess the distribution of data values. This step is helpful if you need to further explore your data to identify potential issues or to better understand what is going on in the data. Below you loop through the points included in each zone and show a histogram of its values. Note that each set of points is stored as a masked array. This is because images must be shaped as squares, while our zone may be any shape that we wish. The mask tells us which pixels fall into the zone. Below you create a plot for each individual field site of all pixel values. You will need to loop through the data in order to create this plot. Bar plot showing the distribution of pixel values for each plot at the SJER field site.